BAD HAIR DAY BE GONE! I walk everywhere and sadly my hair has to pay for it! I do everything in my power to take care of it, the best shampoos, conditioner, shine serum, but as soon as I walk out the door the wind and rain tear it a part. Yesterday was one of those days where nothing could go right.. nothing. When I was walking the four miles home yesterday (I just missed my bus and I was too impatient to wait for the next one)this editorial kept popping into my mind. I don't really wear scarves ever and I do associate it usually with older women, but maybe my hair deserves for me to put my insecurites aside and put it first. Ok, so am probably not going to run out and buy scarves or even wear any. I do appreciate the fact that this editorial really had me thinking about it. In case you do love scarves? Dont forget to enter to win $100 Gift Card to The Bravern - They have an Hermes there. Just click here! Save up your pennies for a keratin treatment, baby! Just found your blog, love it! 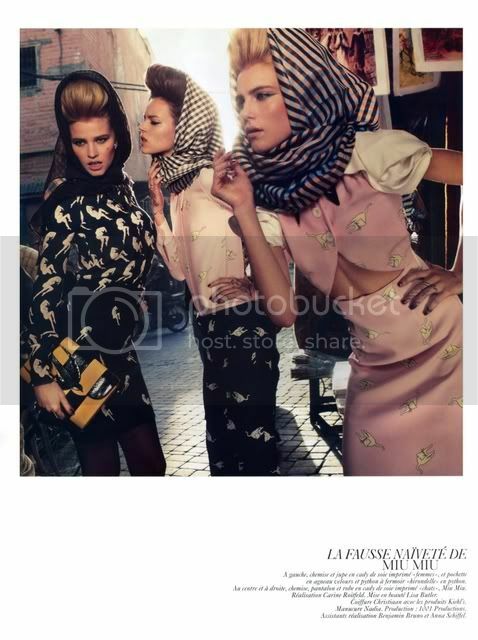 I dont think I could leave the house with one on my head, but it looks good in an editorial spread. i never think about wearing a scarf on my head....it looks so glamorous! I experimented with this look as well and I love it! It is rather bold I have to say but it worth it!